VietNamNet Bridge – A lot of workers have not been present at production shifts these days, because they spend time doing everything they can to force business owners to pay salaries. Real estate firms are the leading ones in the number of workers’ strikes for salary payment. Since the real estate market gets frozen, apartments remain unsold, real estate developers do not have money to pay bank debts and salaries to workers. On March 27, 2012, some 80 workers from Cavico which was implementing a construction item of the A Luoi hydropower plant, went on a go-slow strike, occupying the construction site, demanding the contractors to pay 2 billion to workers, who have not received their salaries for six months. The workers only agreed to give back the construction site on the evening of the day after the competent agencies sent officers to the site and the contractor committed to pay salaries by March 31. The workers of the Construction Machinery Company No 2 in HCM City also have not received salaries for the last six months. Meanwhile, the company has not paid money for workers’ social insurance and healthcare insurance. As a result, workers have to pay their own money for healthcare services. On June 29, the workers executing the The Sammit apartment project in Da Nang City gathered in front of Techconvina’s storehouse, requesting the contractor to make salary payment. A worker said he has not received salary since April, and he has to borrow money from relatives for daily food. In fact, strikes for salary payment occur not only at real estate firms, but also in many other industries. On August 29, the workers from Cimexco flocked to the head office of the Viet A company and the residence of Viet A’s President Pham Thi Loan, asking Viet A to pay debts to Cimexco. A Cimexco’s worker said he has not received any dong from his company for nearly one year, just because Cimexco cannot get debt payment of 10 billion dong from a subsidiary of Viet A Group, which should have paid the debs in September 2011. 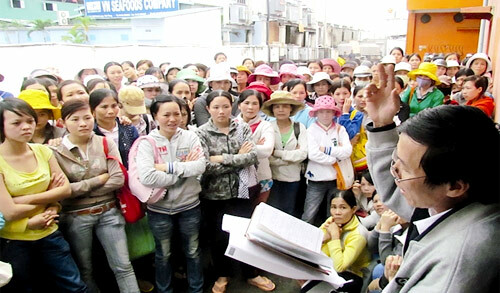 Pham Ngu Hiep was one of the tens workers of an education equipment company, who gathered at the company’s office on September 18 to demand salary payment. Hiep said he and many other colleagues have not received salaries since September 2011. Meanwhile, the managers of the company could do nothing except promising to pay workers soon, saying that the coffer is now absolutely empty. Chasing businesses’ directors to ask for debt payment is also a favorite method by workers, who say they would try every possible method to get pay. Some months ago, farmers gathered in front of the home of Dieu Hien, General Director of Bianfishco, to ask for the payment for the fish they sold to the seafood company before. The company then reportedly owed trillions of dong to banks and hundreds of billions of dong to farmers. Meanwhile, on April 12, 2012, the workers of the company reported to the local authorities and press agencies that Bianfishco had not paid March salary as promised. The company needed to pay 3 billion dong in slaries to 2431 workers. In late July, some 30 workers came to Dieu Hien’s home in Ninh Kieu district in Can Tho City to demand for immediate payment after Dieu Hien broke the promise on making payment.